Plantains are similar to bananas, but contain more starch and less sugar. In addition, they contain higher levels of potassium, fiber and vitamins A and C, as well as other important nutrients such as vitamin B6 and magnesium. I love using ghee when frying plantains, because it gives them a savory brown buttery flavor that is simply out of this world. 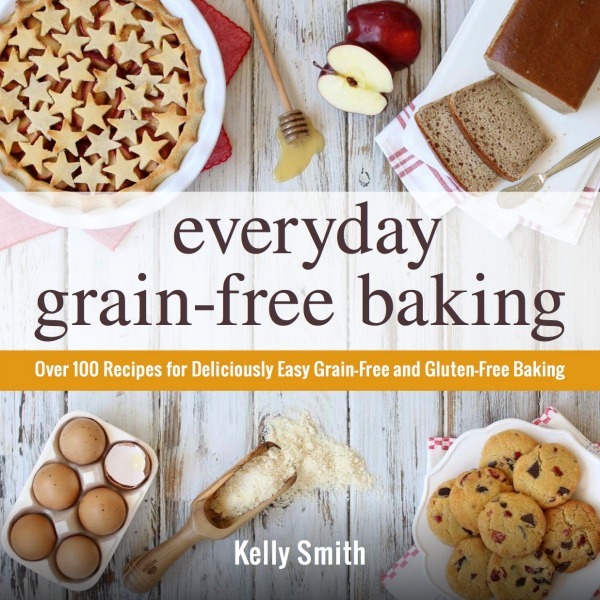 Of course, you can also use butter (if you’re not doing Whole30). Another delicious option is coconut oil, which adds to the natural sweetness of ripe plantains. This latin-inspired favorite is definitely one of the easiest side dishes to make and it’s super quick too, especially if you have a large skillet . I definitely recommend making extras, because it’s hard not to get a little carried away by their incredible flavor. 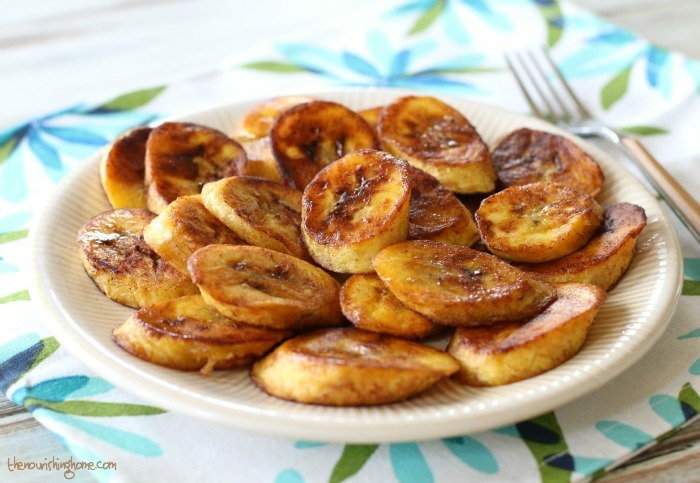 Besides, leftover fried plantains make a wonderful addition to breakfast (see details below). 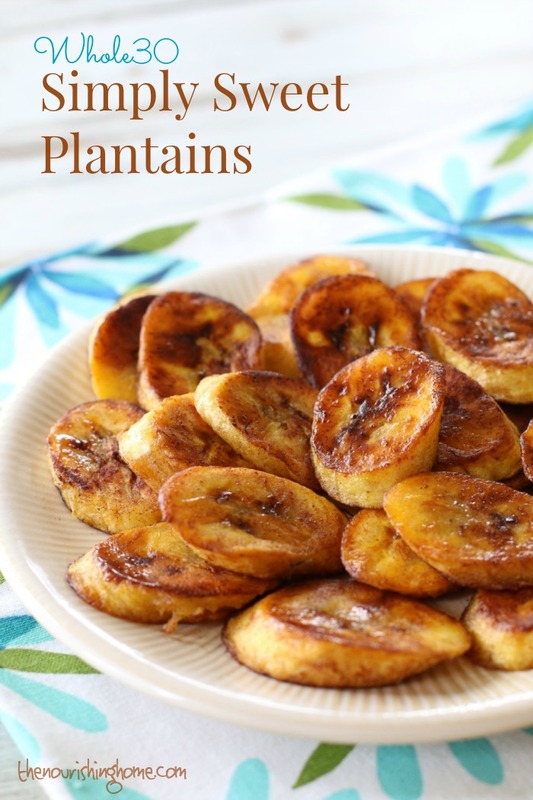 Be sure to use ripe yellow plantains for best flavor. The skins will begin to blacken the riper the plantain gets, which results in a sweeter, less starchy flavor. Once ripened, cut off the ends of each plantain, score the skin using a paring knife and peel. Then cut at a slight diagonal into 1/4-inch slices. Preheat a large skillet over medium heat until hot. Add two tablespoons of ghee (or coconut oil). 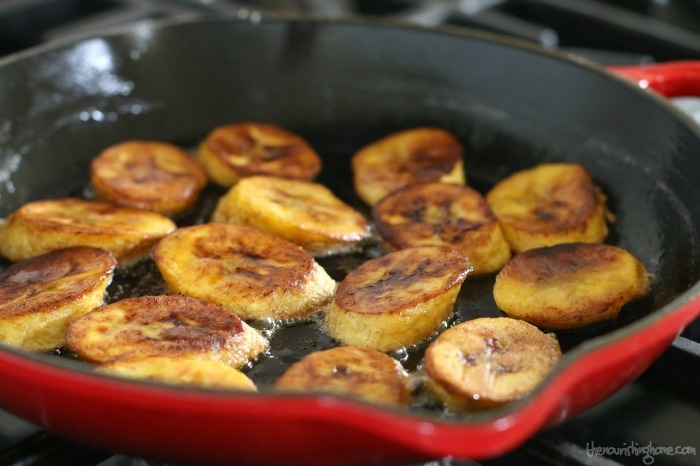 Working in batches, add the plantains slices evenly in the pan so they are not overlapping (as shown in photo above). Fry for 1-2 minutes on one side, until golden brown. Lightly sprinkle the plantains with ground cinnamon. Then, use tongs to flip and cook for another minute or two on the other side. Transfer the fried plantains to a plate lined with paper towels (or a clean kitchen towel). Add additional ghee (or coconut oil) as needed and continue cooking in batches until all of the plantains are fried. Cinnamon-dusted fried plantains are a tasty compliment to just about any main dish, such as grilled chicken, lettuce-wrap tacos, burgers and more! Got leftover plantains? 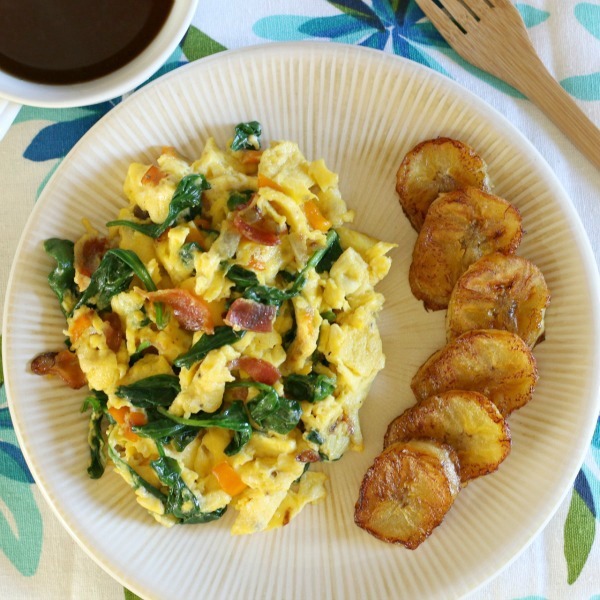 As shown below, you can wake up those sleepy heads with a nutritious breakfast that combines the all-natural sweetness of ripe plantains with a hearty veggie egg scramble. In less than 10 minutes, dinner leftovers are magically transformed into a newfound breakfast favorite! Hmmm is this ok for glueten free?